Use Shop Air or other Low Pressure Gas Pilot to Control a Wide Range of Fluid or Gas Mediums. Doering shop air (pneumatic) pilot operated valves provide a simple solution to controlling mediums such as HYDRAULIC oil, NITROGEN or other fluids or gases. We offer many pilot to working port ratios. This allows the use of standard shop air pilot (50-150 psi). 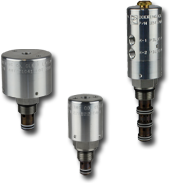 Working port pressure ratings are available up to 5,000 psi on some valves. Doering Valves feature an Isolation Zone to prevent crossover of working port mediums to pilot medium. The pilot section is isolated from the working ports by a vent to atmosphere. The vent area is protected with a 10 micron internal filter. Other venting options are also available. Material options include Aluminum or Stainless Steel Pilot Operators. The high pressure (working ports) Poppet or Spool seal materials are heat treated Stainless Steel (17-4 PH900). Soft Seats (Kel-F) are available in some valve models. This is an ideal feature for sealing Nitrogen or other gases. It is also a good feature when valves are used for hydrostatic pressure decay testing.